When I last wrote about the Mets – during the All-Star break – I cautioned fans and the like to be patient with them. I felt they were primed to stay in the National League East race, that their offense couldn't possibly perform worse than it had in the first half of the season and their pitching would keep them in most games. Lastly, and toughest to sell, I predicted that General Manager Sandy Alderson would pull the trigger in free agency and add a piece or two to help the team’s dilapidated offense. Alderson didn't make it look pretty. But, despite a blood thirsty New York media frenzy that essentially dared Alderson not to make a move and a severely botched non-trade that caused the young Wilmer Flores to shed tears on the infield, the Mets reached yesterday's trade deadline having added four new pieces for the stretch run. New York strengthened their bench, bullpen and acquired that much needed power bat by adding Juan Uribe and Kelly Johnson from Atlanta, Tyler Clippard from Oakland and Yoenis Cespedes from Detroit. Alderson was able to pull it all off without giving up any of their star pitchers, including the rehabbing Zack Wheeler, who was reported to be part of the failed Gomez deal. They also held on to Flores, who has shown promise this year. The Mets were able to use talent from their suddenly stacked minor league system to complete these much needed deals. The Mets seem more than equipped to make a realistic run at the solid but unspectacular Nationals, who arrived at Citi Field Friday with a 3-game division lead. New York now has a deep roster with players who can play multiple positions, some better than others. Now that the pressure is briefly off Alderson, the likely next person in the line of fire is Manager Terry Collins. He will have to perform better at his own job if the Mets are going to be true players come September. Collins has made curious decisions a habit, whether it be pulling starters too early, leaving them on the mound too long, or lineup decisions. With the added depth and talent on the roster comes more chances for Collins to press the wrong buttons (I won't even mention his proclivity for odd press conference behavior). He will now have to juggle time between Johnson, Flores and Murphy at second base, Murphy, Uribe and maybe even David Wright at third, and the outfield is suddenly a logjam with Cespedes, Granderson, Conforto, Lagares, Nieuwenhuis, Cuddyer, and even Eric Campbell. I dare say, I don’t have the utmost confidence in Collins’s ability to make it all work. Lets hope I'm wrong. Depth problems are usually described as good problems. The post trade deadline could not have started more positively Friday. Though Cespedes could not join his new team in time for yesterday's series opener versus the Nationals, the Mets were set up well for the series with their top three young guns on the mound, Harvey followed by Jacob deGrom, then Noah Syndergaard. He started the game with five and a third innings of perfect work before giving up a single to Jose Lobaton. But, the night belonged to, guess who? Flores. Remember, it was Flores who was put through the wringer two nights ago. Word spread quickly via Twitter that the Mets and the Brewers had agreed to terms on a trade that would send Carlos Gomez to the Mets for Zack Wheeler and Wilmer Flores. The only problem was Flores was currently playing shortstop at Citi Field for the Mets versus the Padres. The deal was confirmed by various media outlets and being talked about on the live game broadcast, but Flores remained in the game, cameras focusing in on his every emotion. When he stepped to the plate, astonishingly still in the game in the late innings, he received a farewell standing ovation from the New York crowd who seemingly knew more than he did. When he ran out to his shortstop position (still in the game) for the next half inning, cameras again zeroed in on the 23-year-old. He was seen wiping tears away from his face with his fielding arm. 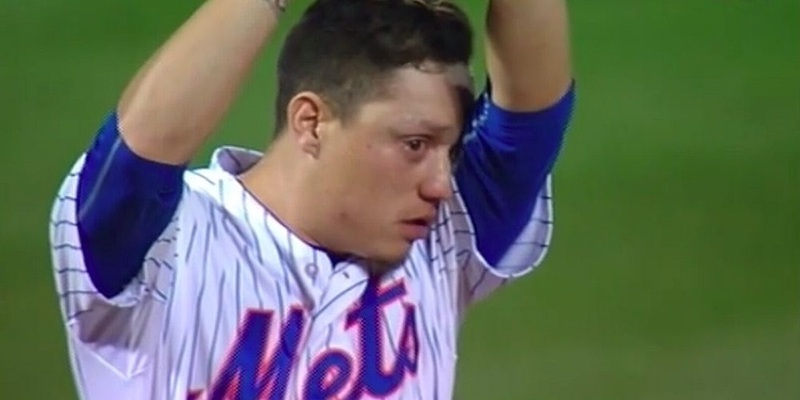 Wilmer Flores was emotional Wednesday night. You could tell early that yesterday would be a better day for Flores. In the first inning, he robbed Yunel Escobar of a hit with a diving stop and accurate throw to first base. The crowd rewarded Flores with a prolonged standing ovation; part appreciation for the play, part appreciation for his refreshing show of emotion two nights earlier, and part apology for jumping the gun. In the fourth inning, Flores drove in the game’s first run with a single to left. Another standing ovation ensued. That run was enough to keep the Mets ahead until the Nationals finally broke through against Harvey and tied the game in the eight inning. Flores stepped to the plate again in the bottom of the twelfth with the game tied at 1. This time he lined a shot over the left centerfield fence. He raced around the bases into the mob of teammates waiting at home plate. What a difference two days make. If that's not a good sign for the Mets’ stretch run I don't know what is. But, then again, it's the Mets. So, we shall see.